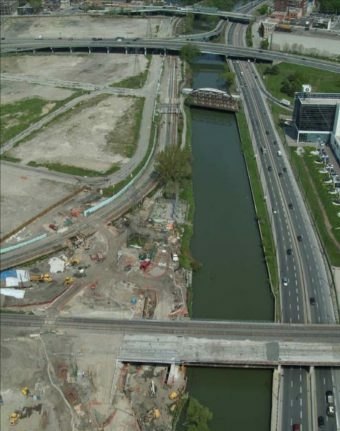 The Lower Don River West Remedial Flood Protection Project, approved in 2005, laid the framework for producing what was eventually to be known as Corktown Common, a flood protection landform that eliminates the risk to life and property to ~210 hectares of land west of the lower Don River. 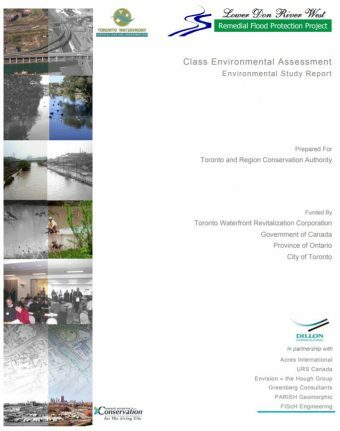 Following the Class Environmental Assessment (Class EA) process, the Project was undertaken to examine alternative flood protection systems, and their environmental effects, for the permanent elimination of the flood risk that had historically extended as far west as the CN Tower. The construction of a flood protection landform (part of Corktown Common), in conjunction with modifications to existing infrastructure, was identified as the the eventual preferred solution that was selected through a detailed comparative evaluation process guided by extensive public engagement. Prior to the completion of the Project and construction of the flood protection landform, flooding west of the Don River during a Hurricane Hazel-like storm event would be enhanced by the damming effect of a too-narrow stream crossing under the Canadian National Railway (CNR) and other utility bridges, as well as the absence of a confining valley around the Don River. The extent of flooding during a storm event of this kind would cover an area of approximately 210 hectares, extending as far west as the CN Tower. High water levels in Lake Ontario and ice jams during the winter and spring could also exacerbate the degree of flooding. Four projects were identified by Waterfront Toronto (formally the Toronto Waterfront Revitalization Corporation) to jump start the transformation of Toronto’s unattractive and underdeveloped central waterfront into a vibrant residential, economic and recreational centre. This vision for a revitalized waterfront consisted of prominent cultural institutions, attractive parks and open spaces, and diverse and dynamic commercial and residential communities. 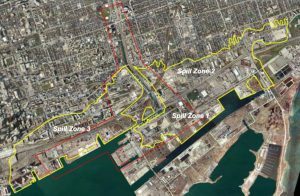 One of these mandated projects identified that an environmental assessment would be conducted to develop the best option to re-naturalize the mouth of the Don River and to provide flood protection for the city’s downtown core. Flood protection for the lower Don River remains a key component of Toronto’s waterfront revitalization. What’s more, Toronto and Region Conservation has identified the lower Don River as the number one priority for flood protection since 1980, due to the large population and extensive infrastructure currently at risk to flooding. The Lower Don River West Remedial Flood Protection Project (LDRW) serves to remove approximately 210 hectares of land west of the Don River from the regulatory flood plain. The natural, cultural, social and economic conditions of the study area have been taken into account in eliminating the risk of flooding to this area. The study for this project began in May of 2003 and received Class EA approval October 6, 2005. 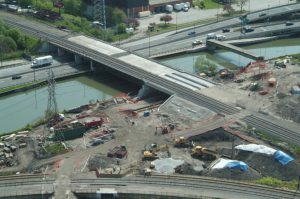 Construction began in May 2006, with the Don River Bridge extension and Bala Underpass completed in 2007 and the flood protection landform finished in 2012. The LDRW was guided by the need to protect human life and infrastructure from flooding by permanently removing approximately 210 hectares of Toronto from the Regulatory Floodplain, west and north of the Don River Mouth. Westward extension of the Don River Bridge, just north of the Keating Channel. The construction of the FPL will provide a physical barrier to prevent floodwaters from flowing westward into downtown Toronto from the Don river, while extending the Don River Bridge will allow those floodwaters to pass underneath and southwards towards Lake Ontario. 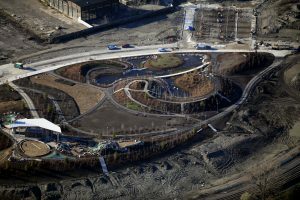 A new jewel in the landscape of the West Don Lands, Corktown Common is a 7.3 hectare (18 acre) park located at the foot of Lower River Street and Bayview Avenue. Situated on former industrial lands, the park has transformed an underutilized brownfield into a spectacular park and community meeting place featuring a lush landscape. With a marsh, sprawling lawns, urban prairies, playground areas, a splash pad and a variety of inviting features like a fireplace, permanent barbeque, large communal picnic tables and washrooms, this spectacular new green space is already the heart of an emerging new community. Approximately 400,000 cubic metres (about 40,000 dump truck loads) of clean soil taken from construction sites within the Greater Toronto Area was used in the construction of this massive landform, which provides the necessary flood protection for the new West Don Lands community, permitting the removal of the flood-plain designation and allowing the land to be rezoned for residential development. The Don River Bridge extension was an essential first element of the flood protection identified in the Class EA. In October of 2006, the bridge sections supporting the two northern tracks were completed. Bridge sections that supported the remaining three tracks to the south were completed in 2007, along with a new section of river channel. To facilitate the construction of this new river channel section, underground high voltage cables were relocated to the west of the new bridge abutment. The Bala Pedestrian Underpass links the West Don Lands community to the existing trail system along the Don River and the Waterfront. Construction of the underpass was completed in June of 2007. Landscaping of the area between the Bala Pedestrian Underpass and the new Don River Bridge, known as the Don River Landing, consists of native vegetation, informal seating and a new look-out along the Don River, immediately upstream from the Don River Bridge. For more information on the Bala Underpass, check out the the accompanying Functional Design Report. What’s New in the West Don Lands? StreetARToronto (StART) has transformed the once plain concrete underpass into an eye catching mural that evokes the aboriginal history of the West don Lands. Read more about the mural here. The West Don Lands served as home to the 2015 Pan/Parapan Am Games Athletes’ Village. Following the games, the village will be converted in to the Canary District, a key component of the long-term vision known as the West Don Lands precinct plan. More information can be found here. 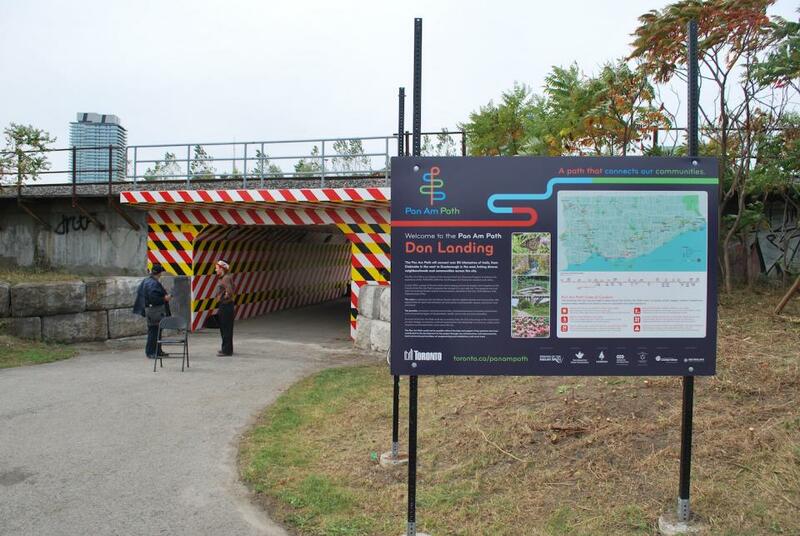 October 8, 2012 – The West Don Lands Flood Protection Landform is Awarded the 2012 Canadian Urban Institute Brownie Award! The Canadian Urban Institutes annual Brownie Award program recognizes leadership, innovation, and environmental sustainability in brownfields redevelopment across Canada. The FPL was recognized with a special award for its contribution to the public realm. To read more about the award, click here. 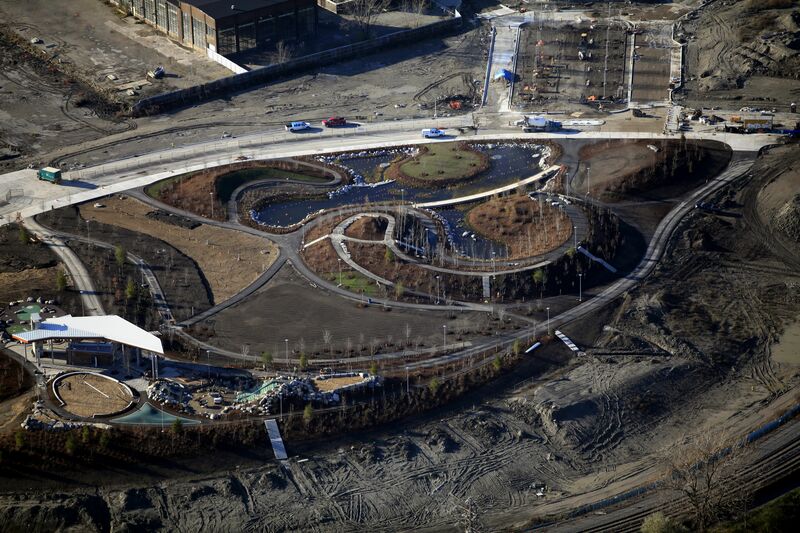 May 2012 – The West Don Lands Storm Water Conveyance System is Completed. Due to the placement of the large flood protection landform within the West Don Lands, storm water on site had to be redirected to the west. 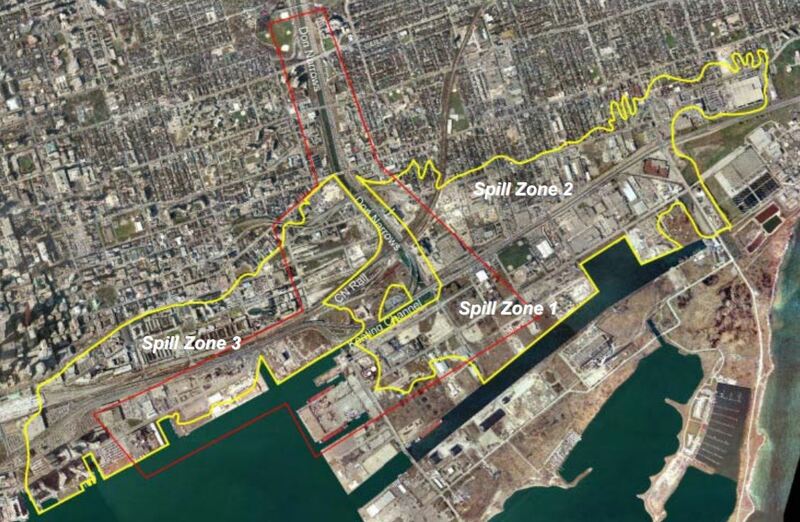 Thus, a new storm water outfall was needed to convey and treat this redirected flow out to Lake Ontario. This system was successfully completed in May 2012 after 14 months of construction. Details about its design and construction can be found here.